Is the kid really this good? Are they really this good? We’ll start with the latter question first, since we can clear this one out of the way like Tuukka Rask casually sweeping aside an unthreatening shot. I don’t know. I don’t, neither do you, and I’m pretty sure Claude Julien, Cam Neely, and Peter Chiarelli don’t know, either. I mean, yes, obviously, what we’ve seen from the Bruins through two games and two victories in the Eastern Conference semifinals is buoying and encouraging. Maybe their relentless, often dominating 5-2 victory over the New York Rangers Sunday in Game 2 of their series is foreshadowing big things ahead. But you know … it’s these guys. The core of this team, with one very notable absence, brought Boston a parade two years ago, and it’s not far-fetched right now to believe right now that they’re capable of hoisting the Stanley Cup again. But they haven’t always handed postseason prosperity well. They have a maddening habit of self-inflicting unnecessary degrees of difficulty, not only during the first-round series with the Leafs, but throughout the second-half of the regular season. The city loves this team, and it should. But they don’t always make it easy, and I find it hard to believe they’ll knock out the Rangers without having to fend off some counter-punches. A quick inventory of the Rangers reminds us that they have an all-world goalie (albeit one in Henrik Lundqvist who gave up five goals Sunday for the first time since March 2011), a coach who acts like he’d choke the air out of a fourth-line forward just to watch him wheeze, a core of defensemen who block shots with no regard for their front teeth and orbital bones, a captain in Ryan Callahan who would be beloved in Boston, and a sniper in Rick Nash who appears to be waking from his slumber. They have a lot, and a 2-0 hole won’t faze them. Somewhere near the first tee, the Capitals are nodding in agreement. It would shock me if the Bruins don’t win this series. It would surprise me if they wipe out the Rangers with the ease of Sunday afternoon. But to say the Bruins will make it hard on themselves solely because that’s who they are is to dismiss the coolest development of this series so far, one that perhaps alters their makeup in a good way. I’m talking about the emergence of the kid, and given that Torey Krug, Matt Bartkowski, and Dougie Hamilton have all rescued the Bruins on their seemingly depleted blueline to some degree in this series, I should probably specify which kid. But if you watched Sunday’s game, you probably know the answer in advance. 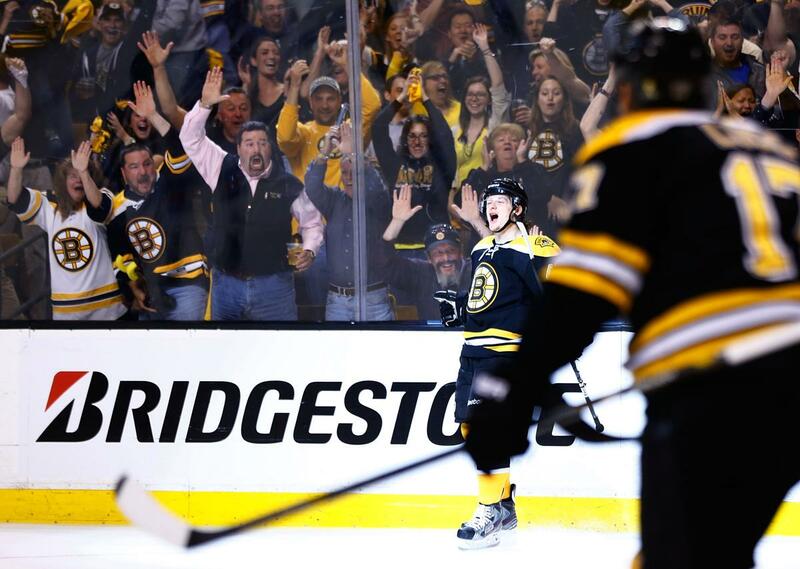 Where have you been all winter and spring, Torey Krug? Actually, the literal answer is Providence, where the offensively gifted 5-foot-9-inch defenseman scored 13 goals in his first professional season after scoring a dozen his final year at Michigan State. He had all of three NHL games to his credit when he was recalled last week after Dennis Seidenberg, Mr. Dependable especially this time of year, was injured in Game 7 against the Leafs. With Andrew Ference already out and Wade Redden also nicked up, Julien had no choice to turn to the underclassmen. 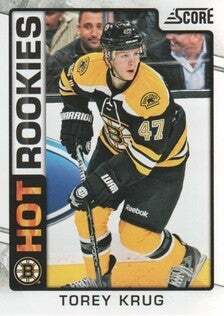 While Hamilton is the heir apparent at 19, and Bartkowski is the “old” man with the reprieve – the 24-year-old was supposed to go to the Flames in the Jarome Iginla deal – it’s Krug who has the most compelling argument that he was born to be a Bruin. He arrived on April 12, 1991 – the off-day between Games 5 and 6 of the Bruins’ playoff series with the Hartford Whalers. That team was coached by Mike Milbury, starred Cam Neely, and eventually lost in the Eastern Conference Finals to a Penguins squad that included Mark Recchi and – you know it – Jaromir Jagr. Perhaps Krug could take Jagr aside before Game 3 and give him some tips on turning chances into goals. All right, that’s a two-minute minor for cheap facetiousness. Really, I’m not ready to suggest losing Seidenberg was anything close to a blessing in disguise. He is essential, and they will need him along the way. Ideally, they would have found out what Krug can do without having an injury to Seidenberg serve as the catalyst. Krug scored the tying goal on the power play in the third period of Game 1, and watching his skill in that situation instantly suggested that he may be part of the solution to their annual power-play woes. He was that poised, that polished. Sunday, he was even more impressive, performing like some sort of Brian Rafalski/Greg Hawgood-circa-1989 hybrid. He scored the Bruins’ first goal, and he did it in style. Taking a pass from Nathan Horton just outside the left faceoff circle, the puck slipped between his skates. Krug deftly poked it from right to left behind his left skate, corralled it, and fired a wrist shot past Lundqvist, who surely wasn’t expecting that. He later picked up an assist on Campbell’s goal, his shot ricocheting off Dan Girardi’s skate and leaving a juicy rebound, which Campbell obligingly backhanded into the net. It was a fine day for an established upper-echelon veteran, let alone a player whose focus was on a series with the Wilkes-Barre/Scranton Penguins a week ago. Krug’s goal is a lock for the Bruins season highlight real. And yet it might not have been my favorite play he made in Sunday’s game. Did you catch this one? Pierre McGuire sure did. With about three minutes left in the second period, Krug collected the puck in the corner, swerved from left to right behind Tuukka Rask’s net, then, as if he’d hit the turbo button on his skates, took off down the middle of the ice, breaking free through the Rangers’ helpless attempts at forechecking. “That’s what you do, skate yourself out of troub …. WOW,” blurted McGuire, NBC’s rinkside analyst. After zipping through the neutral zone and into Lundqvist’s consciousness, he pulled off a half-spin and left the puck for Horton, who fired a rocket that the goalie managed to deflect. “Think the scouts made a mistake?,” McGuire asked rhetorically. Well, that much we’re sure of. Krug can play. But even with the fresh element he’s brought, I’m not counting out the Rangers until the Bruins are the ones smiling in the handshake line. I believe in the new kid. But I’m not bidding farewell to the old habits just yet.